I’ve not been able to post anything for the past two of Cee’s B&W challenges but thought I’d use a determined effort to get back into photography on film, including developing the films, to do a shot for this week’s challenge – ‘Wheels’. Because I’m giving the Contax AX a thorough workout, I chose to use one of it’s unusual attributes – macro with standard lens (Zeiss Planar 50mm f/1.4) and no tubes or bellows (see the previous post). For those of you who are interested in more than looking at entries, there’s more on the AX, stand development, etc, below the picture. Zeiss Planar 50mm, f/1.4 on Contax AX in macro mode, Acros 100 stand developed in R09. 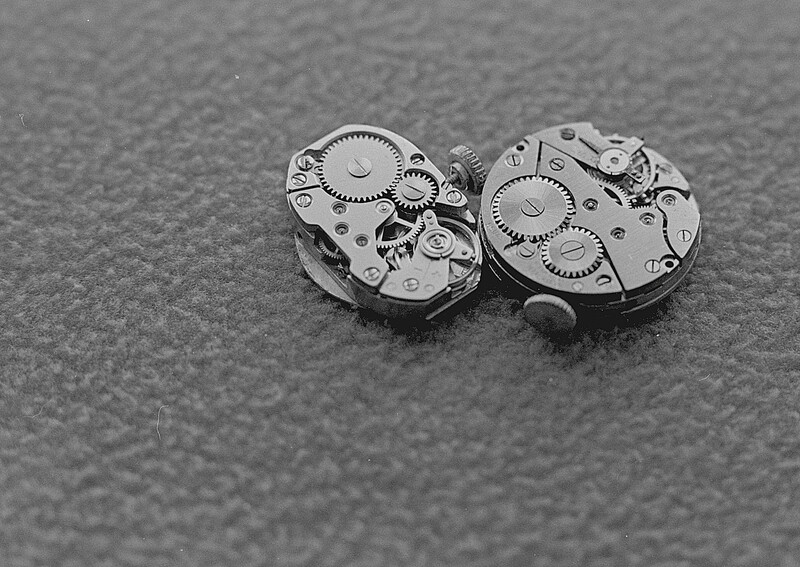 The lens was deliberately left wide open to observe depth of field – just a few mm as you can see (plane of focus is about where the two watches touch). Natural light from window opposite camera. The excitement of opening the developing tank and seeing the negative images there when you haven’t done it for a long time! Wow! It’s not far off the excitement of developing for the first ever time. I’ve said before that a health problem has limited what I could do for some time so I went over to digital for a while on this blog but it’s so good to be back. I was also spurred on by an old post by Brendan on ‘Aware of the void’, about stand development, and his answer to my query, which I then followed up on Jesse Hildebrand’s site where he has a stand development tutorial. I became a fan of stand development some time ago because it not only produces good results but is so undemanding and you can fit it in with a dozen and one other jobs (I have in the past left films to stand develop while out for the day with no adverse results) and it’s very economical. Apart from the film in the AX, I had four others waiting to be developed so, having two 2-film tanks, I decided to develop four at the same time – an Acros 100 and an Ilford PanF+ in one tank, and two TriX in the other tank, followed by the Tmax 100 remaining – all rated at box speed. Some people say you cannot (or shouldn’t) develop different films or differently rated films together. After I had read Jesse’s blog his science convinced me that you can mix and match as you wish, so I did. I chose not to develop all five films together only because I couldn’t be bothered with my bigger – 8 films – tank). I had a half-used 120ml bottle of R09 one shot developer (last opened over two years ago!) so decided to chance that rather than make up some fresh stock D76. I diluted the R09 1:100 with tap water (an advantage of living in Yorkshire – you can just use water out of the tap for everything – no chalk in the kettle after 10 years). Jesse says that one 36 shot film needs 3.75ml of developer so that was 7.5ml in 750ml water to cover two films (which just fits in my tanks). I did ten inversions, left to stand for 1/2hr, three inversions, left another 1/2hr (so, nit-picking, semi-stand development). Quick wash, twice, with tap water. Ilfospeed fixer at 1:9 for 6 minutes. Washed (very slow running water) for 1/2hr. Dipped in Kodak Photo-Flo 200 (I find this makes the film dry more quickly). Hung up to dry. Getting the first two films in the spirals was a bit of a hassle – lack of practice – but then it all went smoothly, though I’m glad of the extra large dark bag. I don’t have a dark room. It’s fascinating developing films which have been lying around for a while; now I have to try to guess which camera they were in and when they were taken. I had intended to post a few more picture but ran out of time (scanning is the time-consuming requirement I really dislike) so they will have to wait for another day. I tried the stand dev for the first time one week ago – exactly with the same developer. I got very nice and clear results and want to use stand process for all films. Thank you for explain ! Thanks for linking to my blog, I’m delighted to see you developing again and that is a wonderful result !